How to transfer music from iPod to iTunes? 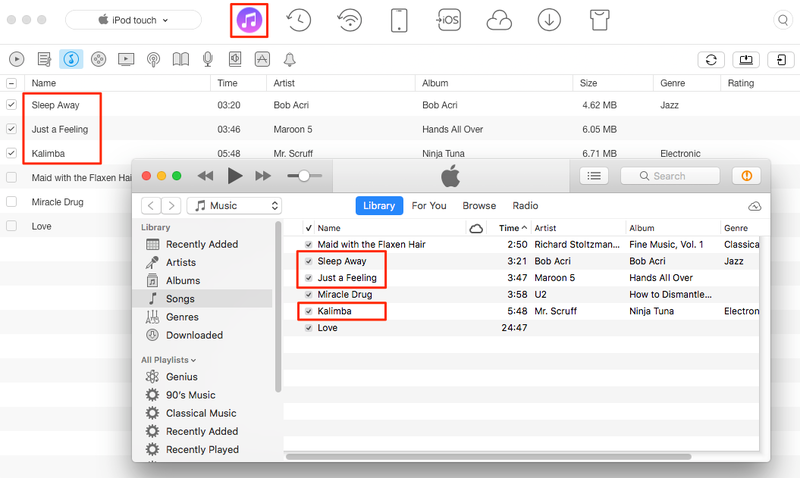 No matter you want to rebuild iTunes library or merge iTunes library from multiple devices, you will find the quick solution to transfer iPod music to iTunes in this guide. Free download AnyTrans on your computer (PC or Mac) firstly, and then follow this guide to transfer music from iPod (like iPod touch, iPod nano, iPod classic, iPod shuffle, etc.) to iTunes in minutes. iTunes keeps all your music in one place assuming they will be safe forever. Until one day you found your computer got a sudden breakdown, and all your lovely tunes saved there were lost. At this moment, an iPod or iPod touch could become a lifesaver. Whatever songs you purchased from the iTunes Store, or imported from CD collection, are supposed to have a full copy on your iPod (touch). So how do you transfer music from iPod to iTunes? What about your artworks, your ratings and play records, and your playlists? Probably it took years to build up that beautiful music library, but how could you restore it again? Keep reading the rest part to get a practical method about how to move music from iPod to iTunes in minutes. You know, iTunes just offers you a way to sync music from iTunes or computer to iPod or other iDevice, and it won’t sync songs from iPod back to iTunes on your computer. 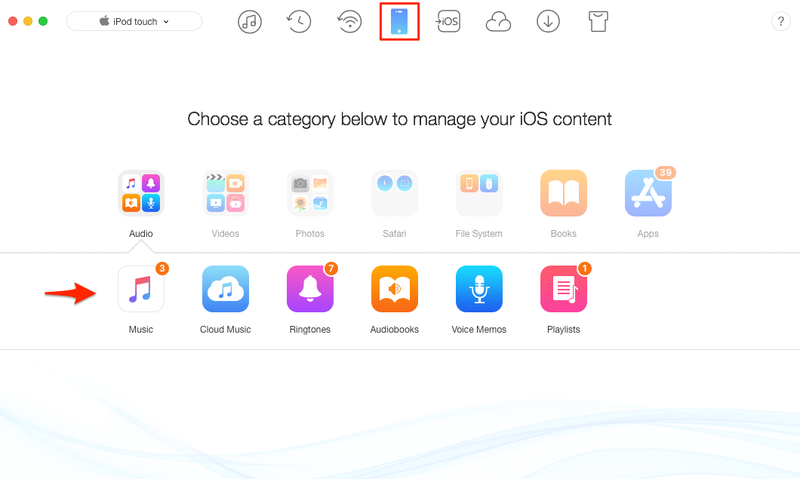 Therefore, to get music from iPod (touch) to iTunes, you can try some third-party software like iMobie AnyTrans. Supports two-way transfer. Lets you transfer music from iPod to iTunes or save to computer, as well as sync songs from iTunes to iPod without data erasing. Keep all the information. During transferring, the playlists, ratings, plays and other info will be transferred as well as songs. Supper fast transfer speed. Lets you transfer hundreds of songs in several minutes. Besides music, it also lets you transfer audiobooks, podcasts, voice memos, moves, ringtones, apps etc. Whatever you want to transfer, AnyTrans is at your hand. Step 1. Open AnyTrans > Connect your iPod or iPod touch to the computer. Step 2. Choose Device Manager > Go to category management screen > Click Audio > Choose Music. Step 3. Select the songs you want to transfer, then click the Send to iTunes button to import music from iPod or iPod touch to iTunes library. 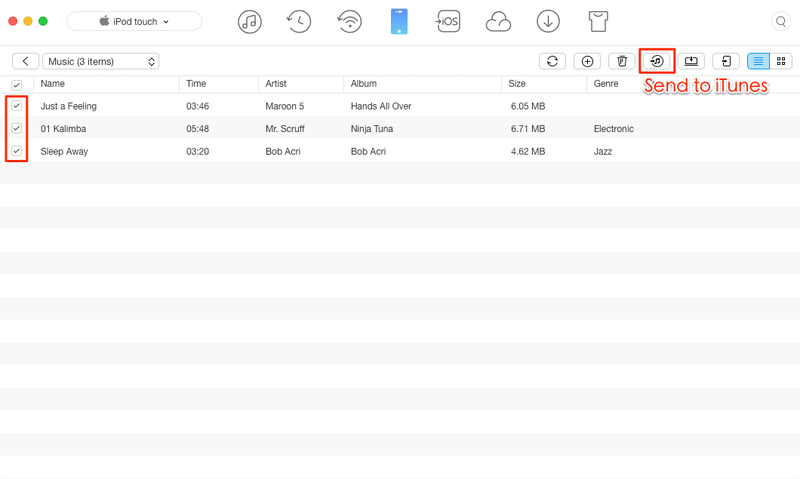 When transfer completed, you can click iTunes Library to check the songs. Or you can also go to iTunes to have a check. Can be used to transfer music from iPhone and iPad to iTunes library, and you won’t lose any existing data during transferring. Helps you transfer iPod music to another iDevice directly, like iPhone, iPad, and another iPod. Allows you to transfer what you like from iTunes library to iPod or iPod touch, instead of performing a complete sync without choice. Supports many audio formats, even some are not supported by Apple devices, like, m4a, m4b, m4r, wma, etc. During transferring, AnyTrans will convert these incompatible music or songs to the supported formats automatically. Don’t stop here, download AnyTrans now and start free trial. If you have any question or meet any problem when transferring iPod music to iTunes with AnyTrans, and please be free to contact us via Email.